With an on-vehicle power system, vehicles are professionally converted so the power of the engine is used to drive auxiliary equipment, rather than carrying or towing a separate generator or compressor. 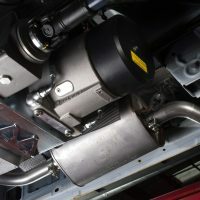 On-vehicle power systems can provide compressed air, electric and hydraulic power, and even high pressure water jetting, and can therefore be used for a multitude of tasks carried out on the road. Typically, they are used to operate road drills, breakers, hand tools, submersible pumps, site lighting and electrofusion equipment, many of which can be used simultaneously. Our systems can be fitted to a wide range of vehicles, from light commercial vehicles to 26 tonne lorries. Van conversion customers include utility companies, emergency services and mobile tyre fitting operators. Compared to the traditional approach of using separate plant to supply power, on-vehicle systems offer many benefits. Importantly, vehicle utilisation is significantly improved. Employees essentially drive a mobile work station; within their vehicle they have everything they need to carry out their work, especially if racking, workbenches and lighting are fitted too. Therefore, there is no need to tow additional equipment (which might require the driver to take a separate driving test to obtain the correct licence, and towing can of course be hazardous) or to arrange (and wait) for equipment to be delivered to site. In addition, employees benefit from a cleaner working environment because of lower exhaust emissions, as well as safer working conditions due to reduced operational noise levels; Winton on-vehicle power systems operate at only 72dB(A), well below the level at which employers must provide hearing protection and hearing protection zones. When choosing an on-vehicle power provider, we recommend comparing life cycle costs (including fuel consumption) and the service offering. But there are some important legal requirements to be aware of too. It’s also important to consider the impact a conversion will have on payload, especially now that extra technology – and additional weight – is being fitted to light commercial vehicles to meet Euro 6 emission regulations. In recent years we’ve reduced the weight of our core system by almost 70 kilograms, and always weigh systems when they are fully installed, ensuring that the true weight of all fittings, oils and any ancillary equipment the customer requires is properly captured. Winton’s on-vehicle power systems can include a compressor, generator, inverter and/or hydraulic power, alongside a range of ancillary equipment, including racking and workbenches, external light bars and work lights.